What Makes a TV Show ‘Black’? Earlier this year I called Orange Is the New Black the best black show currently on TV. The point was that even though the show’s lead character was white, the series unearthed both powerful stories of black characters and a shining showcase of black talent. Laverne Cox, Danielle Brooks, Samira Wiley and Uzo Aduba, in the Emmy-winning role of Suzanne “Crazy Eyes” Warren, each became breakouts as they played out the harsh realities of prison life. Sometimes a “black” show—like ABC’s unapologetic Black-ish, which premieres Sept. 24—is clearly marked as such, promoted with an all-black cast and marketing clearly aimed at the African-American audience. While legendary shows like Roots, The Cosby Show, The Fresh Prince of Bel-Air and The Jeffersons aren’t disputed as black classics, when we were discussing our roster of the Greatest Black TV Shows Ever, the question we came back to repeatedly was, what makes a show “black”? Does the fact that The Oprah Winfrey Show had a primarily white audience make it any less of an accomplishment for blacks in media? Winfrey and her incredible run in television may never be matched as she turned her very name into a media empire. Even if you weren’t a regular viewer, it’s impossible to discount the power and scope of what one woman achieved with one show. 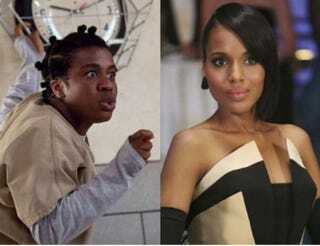 Scandal was created by a black woman and stars one as well, but it almost didn’t make the cut, with others quick to point out that Olivia Pope is often overwhelmed by the number of white characters in power, and the soapy drama rarely introduces other characters of color. Does that mean Scandal isn’t black enough? Nickelodeon’s ’90s sketch comedy series All That had a majority-white cast but a distinctly urban feel: TLC sang its theme song, and its weekly performers were more often than not hip-hop and R&B acts. Many of us watched Nick Cannon and Kenan Thompson transform from teen comedians to legitimate stars. Where does a show like this land on the scale of black TV? There were plenty of shows that forced us to question the TV color scale, and not all of them (sorry, All That) made the cut after days of discussion. But we truly feel that each of the shows listed on the ballot added something valuable to the landscape, whether it’s a landmark moment for black achievement, a transformative portrayal of truly layered black characters or a determination to tell black stories, no matter the cast. For the next three weeks, we’re allowing you to vote for what you believe are the best black TV shows of all time. We’ve assembled a roster of old and new, everything from dramas to comedies to animated series to talk shows. Vote for your favorites here as we celebrate the programs that made us laugh, cry and come together while they reflected our experiences. Vote for the 50 Greatest Black TV Shows ever.